The use of traditional craft techniques has become increasingly popular in fashion and textiles recently, as many consumers search for a more unique, handmade quality to the products they buy. Graduate textile designer Gemma Barlow talks to AVA about her designs and explains how an element of British history inspired her graduate triptych of rugs. Gemma graduated this year with a degree in Fashion and Textiles BA (Hons). Some of her designs were selected in the Hill & Co. Rug Design Competition for John Lewis, 2011. AVA: What would you say was the most interesting or enjoyable part of the course you studied? GB: I really enjoyed learning how to hand tuft rugs – and being given the opportunity to work on large-scale pieces, as this is the scale that I work best with. For my dissertation I looked at how 1970’s feminist embroidery has influenced female textile artists today, which gave me a more rounded self-analysis of my work and the reasons why I choose to work with textiles in the way that I do. GB: Memorable? Handing in my dissertation a WEEK early! GB: I’m a bit of a day dreamer and tend to notice small details from everyday life that many people would probably never look at, such as peeling paint, shadows and how they change throughout the day, patterns in nature. I also like industrial heritage and looking back to the past and reinterpreting these ideas for the contemporary world. I like my work to have a story behind the design and/or imagery. GB: There are lots of artists that I admire, such as Ghada Amer and Uta Barth, but I think the biggest influence that I have is wanting to produce work that means something to me and hopefully to other people – I really believe that it is important that there is understandable and accessible art. GB: The rug triptych incorporating rope work that I made for my final collection as this combined my love of large scale work, my attention to detail and the look to the past, celebrating the histories of Britain’s canals and the people who worked on them. AVA: Have you worked with any clients or on any previous projects? If so which clients and what kind of project? 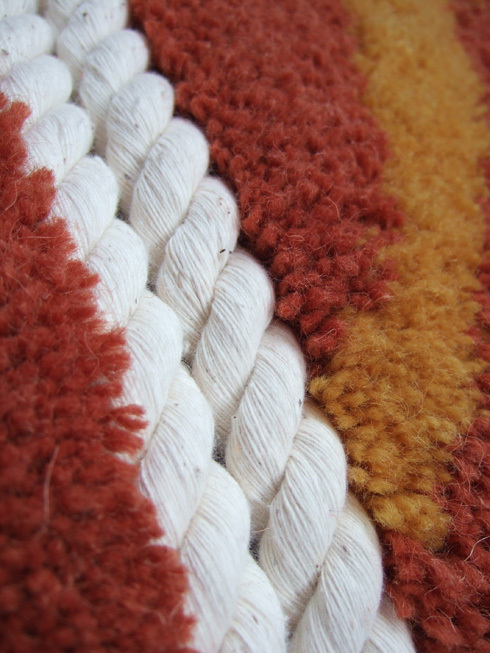 GB: I designed a range of rugs for a competition for Hill and Co. Rugs from a brief entitled ‘1970’s Retro’. Some of these designs were selected to be presented to John Lewis buyers and could possibly be sold in their stores. Hill and Co. may also sell some of these rugs. I also do various bits of work, such as paintings and embroidered pieces for friends. 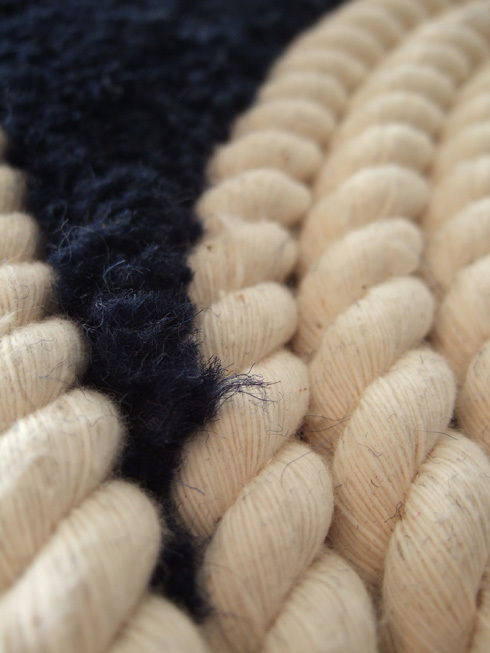 GB: For the large wall hanging rugs that I made I used 80/20% wool/polyester yarn, into these rugs I also incorporated rope as my inspiration came from rope work of traditional working narrow boats that was both decorative and functional – just as my rugs are. GB: Bold, natural, thoughtful, eye-catching, thought-provoking. GB: You should always do what you feel passionate about. It’s good to stay true to what you believe in and to develop your own style – there are no right or wrong answers. AVA: What are you currently working on now you have graduated? 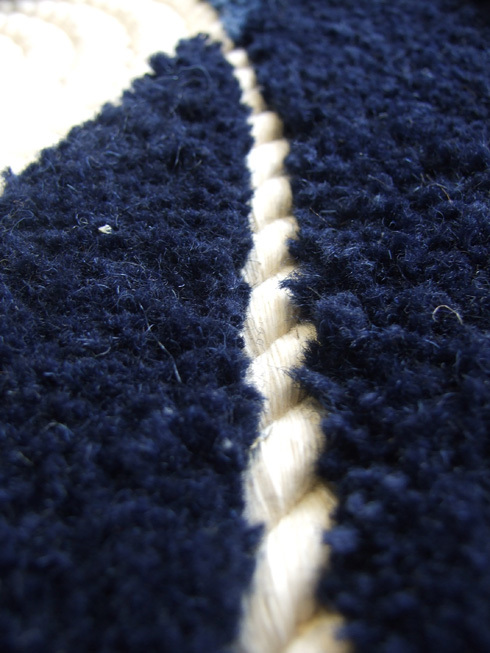 GB: I want to carry on making rugs and am hoping to do some artist in residence work at the University – money permitting. I’m also looking for a suitable job that will support this both financially and creatively. 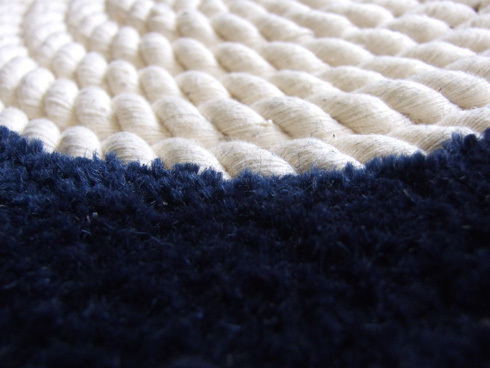 GB: Initially I want to gain some work experience in a creative design career, but ultimately I want to be working for myself – creatively in some capacity, ideally making rugs. I know this will be hard work, but it’s what I love doing and it makes me happy. You can see more of Gemma’s textiles on her ARTS THREAD page. If you are interested in textile design, check out our textile design and fashion design books. Gemma, do you take on commissions? Thanks for your interest, I have e-mailed you, hopefully I can work with you. Nice post! !Your work looks to be interesting counting towards the perfection. Providing such prolific designing is truly splendid. I feel that designing is really important especially for home and nothing can be taken as granted.This design depicts the well furnished dream.